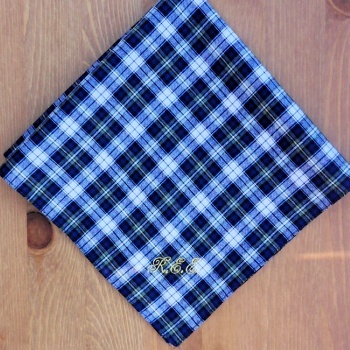 Personalised embroidered mens Gordon tartan cotton handkerchief. You can choose to have personalised with initials or a name in a text thread colour of your choice. This fabric design is the Gordon New Dress Tartan hanky which features blue, white, green and yellow in the tartan.